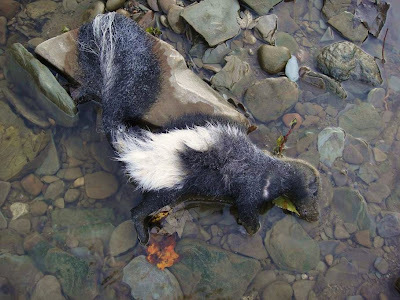 Every angler experiences it from time to time, the dreaded skunk. The times, when we throw everything in vain, cover endless miles of water and look to the sky in frustration. In my case, it was literal as I came upon a dead one lying in the water on the lower Conneaut. It was waterlogged and ripening, and the smell was overwhelming. Which made me think, was he responsible for the all of the non-action downstream? It was morning and early in the steelhead season. I had pounded several holes and pools downstream without much success. The dead skunk should have been taken as an ominous sign that things might not be fine and dandy today. But, I'm a half glass full kind of angler. I looked at him one last time and wondered if any of the critters in the woods or water would have to the courage to feast on his filthy rotting corpse. The skunk happens when we less expect it. The conditions can be perfect. But, whatever reason, the fish won't bite. There's noting we can do, but scratch our heads. It can be maddening, because there's been times when I thought I would gotten skunked and I couldn't stop the fish from biting. But there are certain times when the skunk will rear its ugly head and that usually early in the season here along the Alley. It was unseasonably warm and the creek was running low and clear. I knew before heading out and I knew there would be a pretty chance of me getting skunked. The other option would to be sitting at home and doing nothing but thinking about the better days ahead. When I arrived at the creek at first light, its warm enough that I don't even need to wear a jacket. The Alley was experiencing a beautiful Indian summer. You couldn't ask for a nicer day and I figured most of the guys I knew would be out on the lake, getting in the last perch or walleye outing before the winter winds would usher in the end of the season. I walked down the train tracks and my boots kick up dust, It's been another dry fall, but weeks before the stream blew and there were reports of fish moving in. Conneaut is practically on the state line with Pennsylvania and the creek does start in that state. Both states stock steelhead in it and Pennsylvania's fish are a fall run. That's why Conneaut is a popular stream because it gets good runs of fall and spring fish. When I get the bridge, the stream is barely flowing. I see two angler watching their floats, barely move. They could go for lunch and come back and the float would have probably moved half the length of the pool. I don't even bother to fish above them, because most likely that spot has been pounded for weeks. Deep water was few and far between on the lower section. The only action I was getting was fighting off the repeated hit and run attacks of the resident creek chubs. I would watch with great disdain as the float popped up and down. It was wasn't that violent take that is often associated with steelhead. I would flick the float as if they were that annoying fly bothering me. When I reeled in the line, I would see the sac nibbled down to the last few eggs. By now that glass that was half full, is gradually getting a little more empty. In most spots, I can see right to the bottom. I'm starting to run out of deep holes and pools. It's almost late morning when I finish up at the last spot and the riffle above is barely registering a gurgle. I stand on one othe train trestle supports and look over at the shale ledge. It relatively dark and could possibly hide some fish. I work the spot and my gut tells me there probably isn't any in there or they've been caught repeatedly. The glass is empty and I'm resigned that today isn't going to be the day. I chug some water, hang my head and head back downstream. We've all had our fair share of the skunk, even the most experience steelheaders have had those where they have nothing to show for. Lucky for me, my skunks are few and far between. On the way back, I see my old friend baking in the sun and not a single fly is hovering around, go figure.